Bob Melamede was pissed off, which seemed out of character for a laid-back guy who laughs a lot. Plus, he’d begun the day as he always does — by ingesting 80 to 100 milligrams of oil containing tetrahydrocannabinol, the psychoactive compound in cannabis. That’s enough THC to leave most stoners blissed out for hours. But Melamede saw good reason to be indignant on a late September morning outside Burlington’s Bern Gallery, where the annual Pipe Classic glassblowing competition was in full swing. A retired DNA researcher, microbiology professor and international cannabis activist, Melamede had heard that a Burlington police officer confiscated all the cannabis oil from a medical marijuana patient who’d flown into town for the event. The patient, Courtney Soper, arrived at the gallery a few minutes later. The 40-year-old mother of three from Long Island, N.Y., confirmed that, after checking into her hotel the previous night, she had driven to an Old North End café to meet some friends who were also attending the glassblowing event. While she was parking her rental car, she said, a cop pulled her over for making an illegal U-turn. After smelling marijuana on Soper, the cop searched her car and discovered the cannabis oil. Soper handed over her medical marijuana registry cards from New York and California, explaining that she uses the substance to treat several conditions, including chronic pain. The cop didn’t arrest Soper or issue a ticket, but he took her drugs. He was ready to make that point at the police station, but Soper nixed the idea for fear it could bring unwanted scrutiny to the Bern Gallery event. In a text to Seven Days, Burlington Police Chief Brandon del Pozo explained later that his officer was just following protocol: Vermont doesn’t recognize medical marijuana cards from other states. As it happens, thousands of people know “Dr. Bob,” who’s not a physician but has a doctoral degree in molecular genetics and biochemistry. 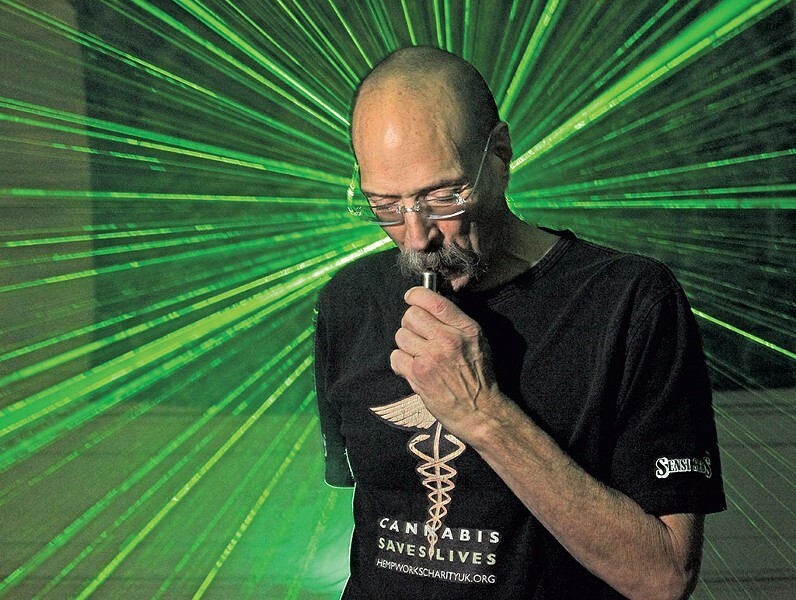 A former research professor who taught at the University of Vermont, New York Medical College and the University of Colorado, Melamede now appears regularly in the marijuana press and frequently speaks at international cannabis conventions. His presentations, some of which can be found on YouTube, invariably delve into the science of cannabis and its relationship to human health. PLEASE CONTINUE READING STORY HERE…. Hurth, Germany: Scientists have conducted over 140 controlled clinical trials since 1975 assessing the safety and efficacy of either whole-plant cannabis or specific cannabinoids, according to a literature review published in the journal Critical Reviews in Plant Sciences. A pair of German researchers identified 140 clinical trials involving an estimated 8,000 participants. Of these, the largest body of literature focuses on the use of cannabis or cannabinoids for the treatment of chronic or neuropathic pain. Authors identified 35 controlled studies, involving 2,046 subjects, assessing the use of marijuana or cannabinoids in pain management. In January, the National Academy of Sciences acknowledged that “conclusive or substantial evidence” exists for cannabis’ efficacy in patients suffering from chronic pain. Cannabinoids have also been well studied as anti-emetic agents and as appetite stimulants. Researchers identified 43 trials evaluating marijuana or its components for these purposes, involving a total of 2,498 patients. They identified an additional 14 trials examining the role of cannabis or cannabis-derived extracts for the treatment of multiple sclerosis. Researchers also identified several additional trials evaluating the use of cannabis or cannabinoids for a number of other diseases, including Crohn’s disease, Tourette’s syndrome, Parkinson’s disease, glaucoma, and epilepsy. A 2014 study published in the Journal of the American Medical Association reported that pharmaceutical drugs typically gain FDA approval on the basis of one or two pivotal clinical trials. For more information, please contact Paul Armentano, NORML Deputy Director, at: [email protected]. Full text of the study, “Medicinal uses of marijuana and cannabinoids,” appears in Critical Reviews of Plant Sciences.